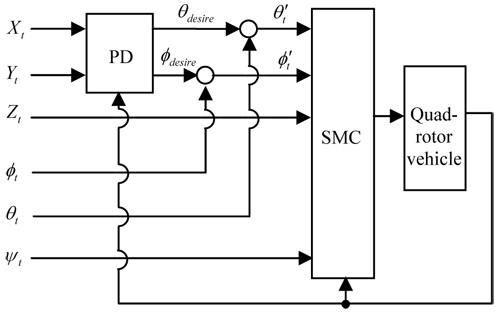 This study applies a sliding mode control (SMC) strategy for a robust controller of a quad-rotor vehicle. First, a controller combined with a nested control loop and an SMC is introduced, because a quad-rotor vehicle has only four control inputs although the vehicle has six degrees of freedom. The control performance for the feedback gains in the nested loop is investigated in numerical simulations. Subsequently, the effects of practical system limitations (control cycle and rotor dynamics) on the control performance are examined. 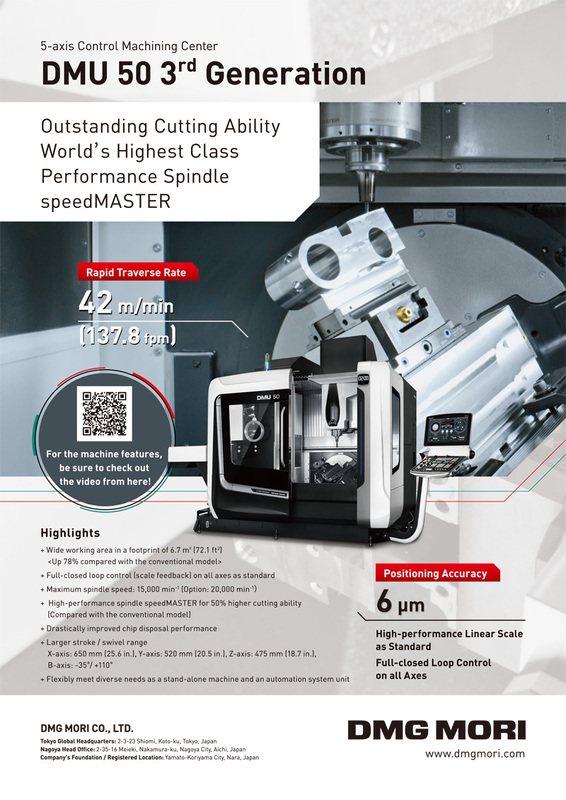 Finally, the robust performance of the SMC strategy on a quad-rotor vehicle is discussed. T. Oba, M. Bando, and S. Hokamoto, “Controller Performance for Quad-Rotor Vehicles Based on Sliding Mode Control,” J. Robot. Mechatron., Vol.30, No.3, pp. 397-405, 2018. S. Bouabdallah, A. Noth, and R. Siegwart, “PID vs. LQ Control Techniques Applied to an Indoor Micro Quadrotor,” Proc. of the 2004 IEEE/RSJ Int. Conf. on Intelligent Robots and Systems, October 2004, pp. 2451-2456, 2004. K. Nonami, F. Kendoul, S. Suzuki, W. Wang, and D. Nakazawa, “Development of Autonomous Quad-Tilt-Wing (QTW) Unmanned Aerial Vehicle: Design, Modeling, and Control,” Autonomous Flying Robots: Unmanned Aerial Vehicles and Micro Aerial Vehicles, Springer, pp. 77-93, 2010. D. Droeschel, J. Stuckler, and S. Behnke, “Local Multi-Resolution Surfel Grids for MAV Motion Estimation and 3D Mapping,” Proc. of 13th Int. Conf. on Intelligent Autonomous Systems, pp. 429-442, 2014. S. Islam, J. Dias, and L. D. Seneviratne, “Adaptive tracking control for quadrotor unmanned flying vehicle,” Proc. of the 2014 IEEE/ASME Int. Conf. on Advanced Intelligent Mechatronics, pp. 441-445, 2014. V. Adr, A. Stoica, and J. Whidborne, “Sliding Mode Control of a 4Y Octorotor,” UPB Scientific Bulletin, Series D: Mechanical Engineering J., Vol.74, No.4, pp. 37-52, 2012. E. Zheng, J. Xiong, and J. Luo, “Second Order Sliding Mode Control for a Quadrotor UAV,” ISA Trans., Vol.53, No.4, pp. 1350-1356, 2014. L. Besnard, Y. Shtessel, and B. Landrum, “Quadrotor Vehicle Control via Sliding Mode Controller Driven by Sliding Mode Disturbance Observer,” J. of the Franklin Institute, Vol.349, No.2, pp. 658-684, 2012. N. Ammar, S. Bouallegue, and J. Haggege, “Modeling and Sliding Mode Control of a Quadrotor Unmanned Aerial Vehicle,” 3rd Int. Conf. on Automation, Control Engineering and Computer Science, pp. 834-840, 2016. A. Joshi, A. Kelkar, and J. T.-Y. Wen, “Robust attitude stabilization of spacecraft using nonlinear quaternion feedback,” IEEE Trans. on Automatic Control, Vol.40, No.10, pp. 1800-1803, 1995. E. Stingu and F. Lewis, “Design and implementation of a structured flight controller for a 6dof quadrotor using quaternions,” IEEE 17th Mediterranean Conf. on Control and Automation, pp. 1233-1238, 2009.